This article originally appeared on the Google Marketing Platform blog. 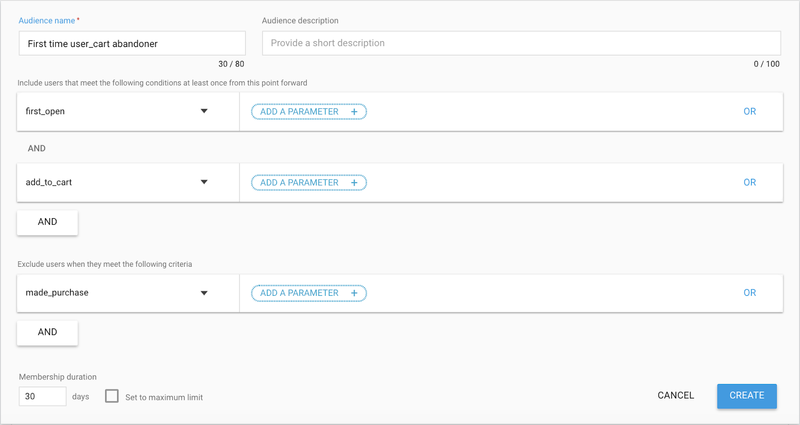 Membership duration: Audiences can now include a membership time frame, such as “users that have converted in the last 30 days”, so your audiences and messaging remain fresh and timely. Let’s say you have an e-commerce app. Using these advanced audience capabilities, you can build an audience of users that visit your app for the first time and add an item to their cart, but don’t make a purchase—and only include those who do so in a 30 day window. With the ability to create dynamic audiences, you are able to understand your users with better precision. A better view into your audiences means more insight into the customer journey, so you can invest in your marketing activities with confidence and see better results—keeping users happy, and your app growing.